We offer wooden venetians in a range of colours including natural and painted slats. Slats come in 3 different widths, 25, 35 and 50mm. Blinds can be either corded or for that more deluxe look, taped. All blinds have matching cords or tapes, although contrasting cords or tapes can be used for some startling effects (black tape on white blinds for example). 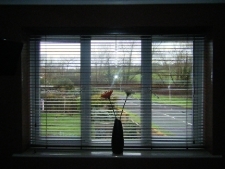 All blinds are supplied with wooden pelmets to give that finished look. Blinds fitted outside of recesses will have head rail ends to enshroud the brackets.